If the startup world has proved anything over the last decade, it's that it takes more than a great product to make it big. And, if some of the space's most successful people are to be believed, fixating on product development can actually blind you to the real problems limiting your growth. "Market risk is the greatest risk that any new product faces"
Product development is a refined, well-documented process. It's something that almost all (technical) founders will understand at an innate level, able to recite the Agile methodology in their sleep. With that kind of background, it's easy to understand where the classic "build it and they will come" attitude comes from: the idea that a product will be so essential, so revolutionary and life-changing, that the act of developing it will be enough to generate customers, attract revenue and scale. Reality check: this never happens. Unless your biotech startup just cured cancer, you product launch won't resemble a torrent of inbound revenue so much as a trickle of bad-fit beta customers. That's because product development is only a single part of creating a functioning, scaleable business. If you're struggling to gain traction, chances are the actual problem isn't product-related: it's customer-related. "Very few startups fail for lack of technology. They almost always fail for lack of customers. Steve Blank is a Silicon Valley serial-entrepreneur, and the man behind the original Customer Development process. He developed the methodology to tackle a fundamental problem: almost all startup growth strategies are weighted in favour of product-development (something familiar and comfortable), at the expense of customer-development (something unfamiliar and scary). 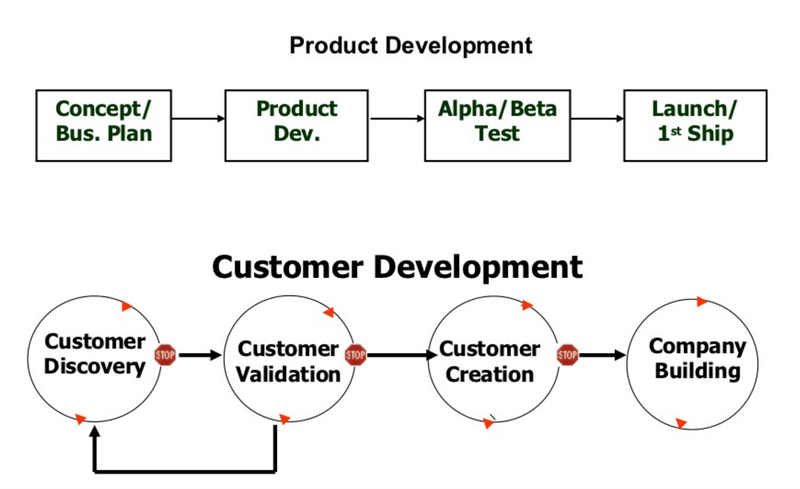 Customer Development is designed to connect each stage of Product Development with relevant customer insights. For every step closer towards product launch, you have a matching set of customer milestones that need to be achieved. At its heart, it's a way to prevent the development of an expensive, perfect product that nobody wants. It shifts emphasis onto learning and discovery before execution, and encourages founders to start asking questions about the real people that'll be using their product. What are your customers' biggest problems? Does your product concept solve those problems? What does a day-in-the-life of your customer look like? How will your product change that? What is the relationship between the users and the buyers of your product? With your fundamental questions answered, it's time to assess whether these types of customers can actually sustain your business. This stage of Customer Development relies on insight from Alpha/Beta testing, and initial sales to early adopters (the technology enthusiasts and visionaries willing to take a risk on you), to test out your sales process and validate the financial model behind your product. Do you have a functioning sales roadmap? Do you understand the sales cycle? What do your key sales metrics look like? i.e. Average Sale Price (ASP), Customer Lifetime Value (CLTV), Return on Investment (ROI). Do you have customer orders to validate your roadmap? Does your financial model make sense? At this point, you've validated A) the importance of the problem you solve, B) your ability to solve it, and C) the revenue potential of doing so. That de-risking means it's safe to launch the product, and start creating customers by channeling resources into marketing and sales: to borrow Geoffrey Moore's concept, you're ready to "Cross the Chasm" and tackle the mainstream market. As Steve stresses, this is a strategy, and not a tactic: and the right type of 'customer creation' will vary according to the type of market your solution exists in. With the launch into the mainstream market, Blank's Customer Development methodology looks inwards, to the company itself. At this stage, the methodology applies the same critical perspective to the company's organisation, leadership and mission - ensuring that the management keeps pace as the company grows. You can't separate out product and customers. Learn before you spend: not the other way round.